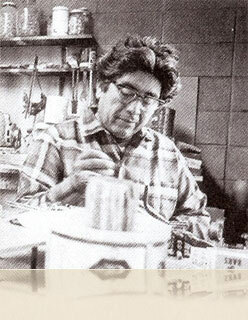 Charles Loloma is widely recognized as the father of contemporary American Indian jewelry because his innovative style was a complete departure from traditional forms. Working from the mid-1950’s through the mid-1980’s, Loloma continually evolved his craft. With the evolution of his work, Loloma attained increasing fame, and today is the most widely collected of any American Indian jeweler. My work with Charles Loloma began in 1975 after I sought him out at his studio on the Hopi reservation and continued well beyond his 1991 death. From four Chicago shows and retrospective exhibitions at the Wheelwright and Heard Museums, to a comprehensive book, my involvement with Loloma has been far-reaching. I have, therefore, been able to acquire a wide range of Loloma's jewelry representing a large sampling of his varied styles. Loloma’s jewelry career began with his early tufa casting of silver. As his fame grew, Loloma began to use gold as a medium and learned lost-wax casting in which molten gold or silver was formed in a wax mold. By the late 1960’s, he began using a wide range of stones in order to form contemporary inlay jewelry of beautiful color combinations. Often, Loloma inlaid the inside of his jewelry more ornately than the outside so that the wearer would be reminded of the “inner” beauty of the work. With the passage of time, Loloma began to select single stones that he fashioned into elegant solitaire sculptural jewelry set in gold.